These luxury premium handmade ball pits by Wonder Space will be a favourite in any playroom and are perfect for tiny tots to bigger kids. It provides endless of fun to kids and has positive influence on child's development. Also, it's comfy for you to lay on and play with your children. All our ball pits are handmade with environment-friendly materials, who are the market leader in high quality modern ball pits. 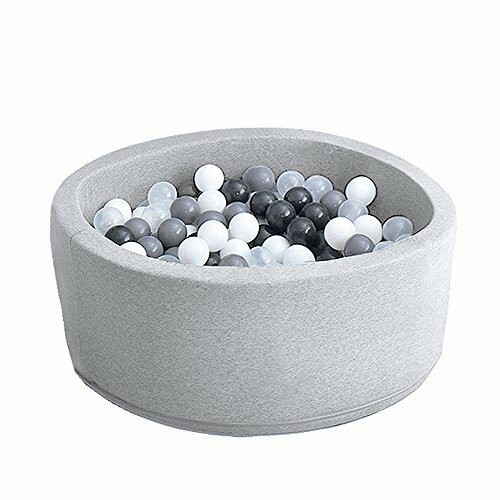 Can be filled with up to 500 balls. Easy to take up/store and transport. Covered by a removable cover which is made of pleasurable to touch fabric (95% cotton, 5% elastane). The zippered cover can be easily removed and hand/machine wash ( wash at 40°). 1. Balls are NOT included. 2. After receiving your ball pit, please allow time for it to regain its round shape after they have been folded for transportation. 3. There are Two Zippers in the body of the pool, one of them is use for connecting the bottom of the pool. 4. As it is handmade product, the size may be a little various from the specifications, please understand and accept this. 5. The color of the ball pool may be a little various from the pictures due to the screen resolution. 6. Odor might exist when just received the ball pit, we suggest to put the ball pit in a well ventilated areas for 3-5 days to deodorize. 【NOTE】1.Balls are NOT included. 2.Came in two parts, zipper in the border can connect the bottom and the side. If you have any questions about this product by Wonder Space, contact us by completing and submitting the form below. If you are looking for a specif part number, please include it with your message. 50 Pcs Colorful Fun Plastic Soft Balls Swim Toys Ocean Ball Pit for Play Tents Playhouses Kiddie Pools Pack 'N Play Bounce Houses for Kids Birthday Christmas Gift 2.16"